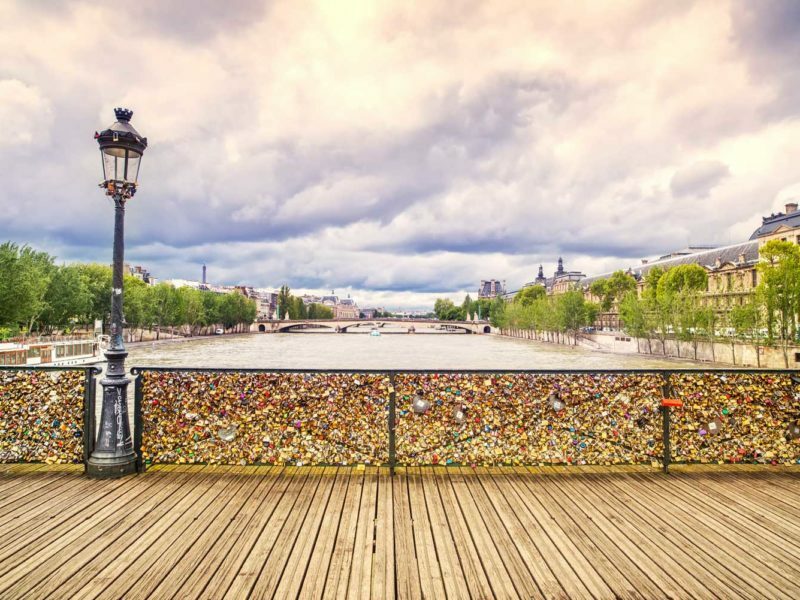 Join more than 700,000 other loved up souls who, since 2008, have made a public record of their undying love (we hope) by placing a lock on the Pont des Art and throwing the keys into the Seine below. The fact that this was the first iron bridge in Paris, finished in 1804 is of little consequence when love is in the air. We take you through the must-vist, must-try and must-see destinations to make any Parisian sojourn truly memorable. Seriously, listing Paris’s attractions would takes days, there are just so many museums and monuments and neighbourhoods and architectural wonders, but we will try to be brief. The alternative (and a better) Kodak moment to the Eiffel Tower, Tours Montparnasse is the top floors of Paris’ only skyscraper. The most famous art gallery in the world with a collection of over 380,000 of which only 35,000 pieces are on display including La Jaconda, aka The Mona Lisa. One of the most famous streets in the world, beginning at its west end with the gorgeous Arc de Triomphe de i’Etoile (to give it its full name), Napolean’s monument to his victorious French armies and culminating at the Place de la Concorde. The Champs Élysées in the evening from the Place de la Concorde with the Arc de Triomphe. The most famous tower in the world, this 324-metre structure is famed as a global cultural icon of France. Part of the big three in Paris, the Eiffel Tower has seen more proposals than Elizabeth Taylor. This si the classic shot from the Mur de la Paix. Watch Parisians relax at the prettiest square in Europe, Place des Voges. And while you are there drop in on the Victor Hugo Museum. Sit on the grass of the Place des Vosges, one of the prettiest squares in Paris in the Marais and see how Parisians relax. Cross the Seine on the Pont des Arts which is decorated with literally thousands (700,000 according to estimates) of padlocks put there by romantic visitors to the city in a gesture of love. Take tea in one of the city’s myriad salons, such as the pastel-hued Laderée (the original store 16-18 rue Royale Arr. 8), with their array of delicate tea blends (in a city known for its coffee culture it surprises many to discover tea arrived in France decades before it did in England) and insanely pretty sweet treats. Deep in thought at the Rodin Musuem, The Thinker was originally named The Poet. There are in fact 28 castings in existence around the world. But this is probably the most appropriate place to see one. Take in one of the smaller galleries in town such as The Rodin Museum, The Picasso Museum or The Victor Hugo Museum. A mosey along the left banks Bouquinisters can unearth some real treasures, a bit like a great garage sale in Paris. 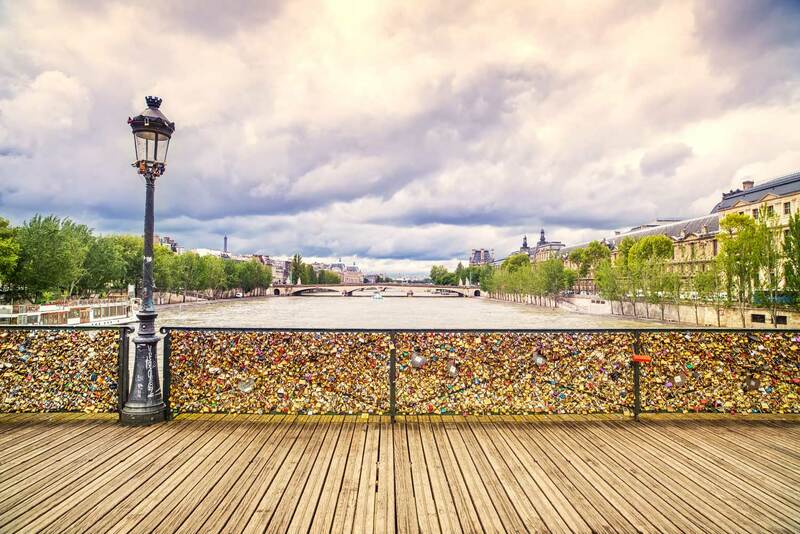 Walk along the left bank and browse the second-hand books and magazines and vintage French advertising posters sold by the Bouquinistes, licensed dealers who set up shop from distinctive green metal boxes permanently located along the Seine. Get a birds eye view of Paris from a different point of view by avoiding the endless lift queues at the Eiffel Tower and going up the Tour Montparnasse instead, the only skyscraper in the city, with the added bonus of letting you take an aerial picture of Paris with the Eiffel Tower actually in it!